It is not the first time that Disney animators have created different versions of scenes and characters to cater to audiences from around the world. Previously, Riley’s broccoli seen in Inside Out was replaced with other foods to appeal to the cultures of various countries. Now, the newscaster from the studio’s latest animated film Zootopia takes the form of a different animal in different countries. 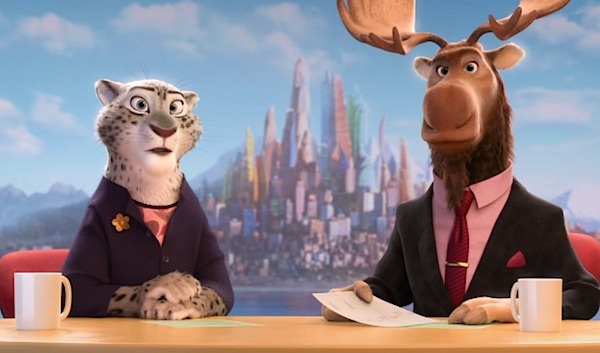 In the US, the newscaster is a moose voiced by popular Canadian newscaster Peter Mansbridge, while singer and television presenter David Campbell voices the character of an Australian Koala, and journalist Ricardo Boechat as a jaguar in Brazil. It is fascinating to know that the voices of the newscasters correspond to the popular voices that the viewers are familiar with in their respective regions. However, it is still unsure who voiced the characters of a corgi in the UK, panda in China, and a tanuki in Japan. Twitter user @RyshatsCorner shared an image of the alternative versions of the Zootopia newscaster. Head over here to discover more fun facts about the film. Scroll down for a closer look at the different animal newscasters.